Easter. In other words, a feast. There would be St. Patrick's Day decorations, St. Patrick's Day cards and even St. Patrick's Day gifts. And, of course, the good china. (She might even serve wine, though she hated the insinuation that the Irish drank too much. Green beer turned her nose.) 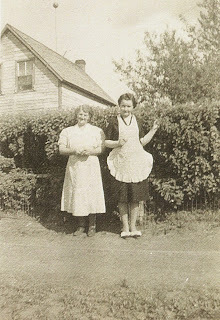 Grandma Jo's maiden name was McNulty, which means she was so Irish she even married one. Both the McNultys and O'Haras emigrated from Ireland to Ontario in the 1840s, the era of the Great Potato Famine, and from there came west early in the 1900s. It's a path followed by many Canadians of Irish decent. It is interesting that the Irish never lost their love of potatoes, even though – and perhaps because – the Great Potato Famine was caused by a lack of them. In 1844 and 1884, a devastating blight swept through Europe, wiping out potato crops and rotting potatoes in the bin. In most places, the loss of the potato was mitigated by other locally-grown foods. But in Ireland, the potato was the only food sustaining millions of rural families, three meals a day. Why was Ireland so reliant on the potato? The population of Ireland had grown so great, and the land laws were so oppressive, that large rural families had to eke out their living on small plots of land. Acre per acre, potatoes produce more food than most other vegetables. Pound for pound, potatoes provide three times more calories than wheat. It was a monoculture, by necessity. Unable to pay rent, many tenant farm families were booted off the land, compounding the devastation. By 1855, more than one million Irish had died of starvation and as many as two million had left the country, the McNultys and O'Haras among them. I am grateful they came to Canada, though I know not the hardship and heartache they faced in leaving their Emerald Isle. So, in honour of everyone who celebrates St. Paddy's Day (green beer and green sprinkles included) here's a traditional Irish recipe in praise of the potato. Peel, quarter and cook potatoes in boiling salted water until tender. Drain. Mash potatoes with butter and milk, adding more milk if needed to make a smooth purée. Keep warm. Meanwhile, cook cabbage in boiling water for 10 minutes and drain. Cook bacon in a large skillet until soft. Add onion and cook until bacon is done. Stir in cabbage and cook a few minutes longer, seasoning with salt and pepper. Blend cabbage into the warm mashed potatoes. Garnish with chopped parsley or green onion. Serve warm.